Some good articles on the new faction, The Idoneth Deepkin. and a more focused look at the basic troops. The eyeless servant caste who's souls are withering away. I wasn’t sure I was going to like them but they are making an impression. What I like is the turtle model and the shark cavalry. I don’t think I ever imagined saying shark cavalry before. I'm actually coming around on their new lore. I was a bit ticked by the whole "Feast on the souls of others", but it's not quite what I thought. The nobles and more powerful are totally fine. It's their children and people who's souls are withered and dying. The nobles are trying to stay isolationist, but if they don't do anything they just watch their people die. The soulless are incredibly resentful of their status. They hate what they are, and they hate their leaders for having what they don't. They hate that they're thrust into the front lines because there's so many of them. Yet they can't do anything about it. They rely on their leaders magic to sustain them and lead them towards more souls. Their hidden cities are pretty cool as well. Including one that's built onto the back of a massive deep water shrimp thing and is known as the nomadic city. Put that way there is a depth to the lore. I wonder if one soul is enough to sustain them per person. I wonder if there will be like a high elf version to match the setting. And if this is the way it’s going, I really can’t wait for the free peoples new models. Their aquatic theme is great. I can envision a fantastic DAoS conversions coming soon! Yah it makes me really hopefully that the Free People stuff will turn out good. It also shows that they are at least trying to put a fair bit more work into the lore behind them. Still very high fantasy, like we were talking about in the other thread, but there at least. 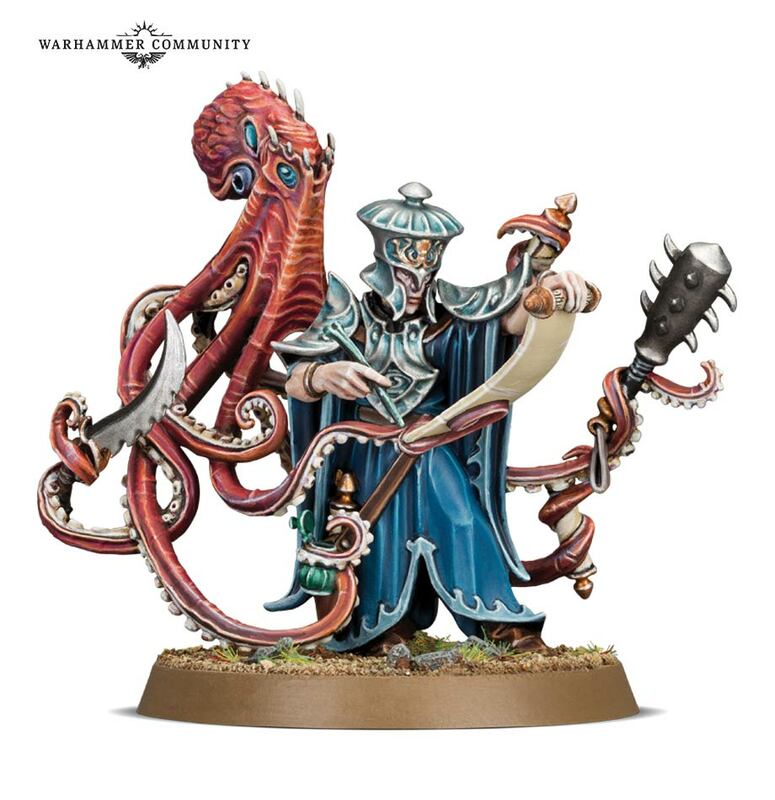 I like any army with a floating squid. Someone called him "Shanktopus". I think that it fits his style pretty well. That's how they get the foot in the door Zak. Give it a few more months and more model releases and we'll have you standing on a street corner praise our lord and saviour Sigmar. (But, in like a new age of Sigmar way and not the old, traditional Empire way. Disappointed by the long bows and two handed axes, neither of which scream "practical underwater use" to me and seem strange choices, so I probably wouldn't even consider the models for other games at this point. Giant flying turtle is cool though, I'll give them that. I'm honestly surprised there's not more tridents. I was expecting cutlasses but they might keep those for sky dwarves and their pirate theme. Look at that glorious octopus. All ready to start shanking anyone that comes near his buddy. Not sure how much I like this new faction. Figures are cool, special rules seem interesting, not sure about the background. Seeing myself actually get into this faction might draw away resources ... time, energy and money ... from other projects. The shipwreck is an interesting piece of scenery. I may pick it up just for that. Aether sea? Shipwrecks appearing once they advance?.. I am too old for that, I guess. I'd rather go for some "traitional" sea factions. Plus, it looks wonderfully Slaaneshy! Love the octopus and his mage. Great model. Where are those minis from, Penguin? I like their style a lot!